The last book I read was Toni Morrison’s Beloved. It was amazing, but utterly dark and heavy. I knew that my follow-up had to be something lighthearted. I also knew that as I transitioned into reading male authors again after a year plus participating in #ReadWomen2014, I wanted one I knew and loved. I needed an author I’ve been with before, someone I could trust. Roddy Doyle feels like an old friend that I’m always happy to see when he stops by for a visit. I had the great pleasure of hearing him read from and talk about his latest novel, The Guts, on my birthday last year. A little over a year later, I’ve finally read the book that turned his amazing Barrytown Trilogy (The Commitments, The Snapper, and The Van) into a quartet. Doyle returns once again to his beloved Rabbitte family, this time focusing on Jimmy, protagonist of the book that started it all, The Commitments. It is a true pleasure to read an author’s return to a character. He wrote the first book and introduced music-loving Jimmy Rabbitte in 1987. An author must feel a great pull, a kinship, to a character if they bring them back after almost thirty years. It only makes my love for Jimmy stronger, knowing he is an extension of Roddy Doyle. As I wrote recently on the blog, I am deeply fascinated by authors who write about the same character(s) for decades. Jimmy’s dad (protagonist of The Van) appears again, as do Jimmy’s siblings. I love this family. They never feel like caricatures; they feel like your slightly dysfunctional but utterly loving family–if your family happened to be a working-class, foul-mouthed Irish clan who would make up a fantastic sitcom that I would watch every week. 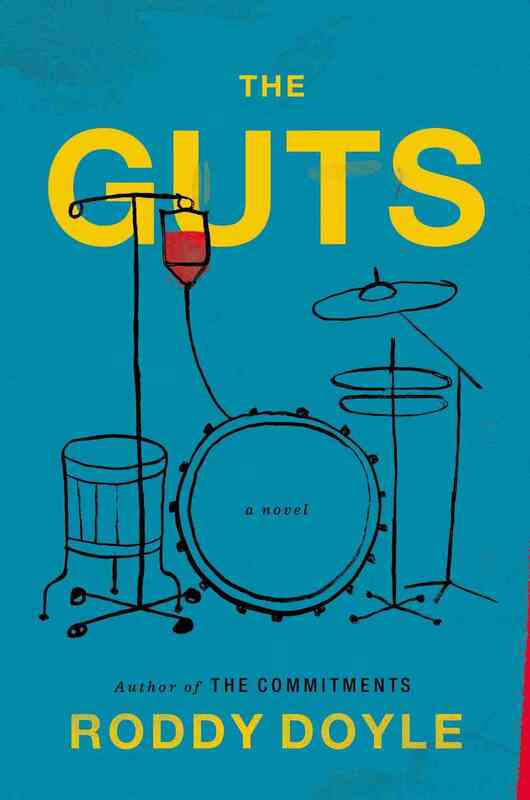 The Guts, like all the rest of Doyle’s work, is laugh out loud funny, the kind of books that make me chuckle to myself on the subway, sometimes loud enough to make even the most jaded New Yorker look at me and wonder at how I can possibly find joy on a crowded train during rush hour. Also like his previous books, Doyle manages to tackle a tough subject with with the aforementioned humor and grace. In The Guts, Jimmy discovers he has bowel cancer. The story follows him through the pain of telling his family, undergoing surgery and chemo, and reconnecting with an old friend who has terminal cancer. Cancer is capital S scary. It is not a subject people would think to write humorously about, which is why Doyle is a remarkable writer. He looks straight into the hardest parts of life–illness, adultery, and death–and finds a way to put a pin prick in them and deflate them with comedy. This is a mid-life crisis book in the best way. Cancer doesn’t determine Jimmy’s life, but it prompts him to re-evaluate it. It is the catalyst for him reconnecting with his family, reinvigorating his career, and really, relearning what it means for him to live his life. And it’s not sappy! The end of the book buzzes with the excitement of living and of looking forward to what life is still to come. I never would have thought that a story about cancer would leave me feeling so positive, but this book once again proves the way a good book is often one that surprises you. I recently read a personal essay about a man who lost his job, was dumped by his boyfriend, and was diagnosed with cancer. Near the end of the essay, he talks about how this string of tragedies cracked open his world. I love this concept and this visual. So often we sleepwalk through our lives, thinking only of what we need to get by. It can take something huge, something like cancer, to break you from that stupor. If you’re lucky enough to survive your personal taste of tragedy, you cannot take that for granted. We cannot avoid pain in our lives, but we can survive it. If we’re able to laugh in the process, we’re all the better for it. Thanks for reading! You should really check out The Guts. I love when a book simultaneously entertains you and forces you to take a moment to evaluate your life. It sounds like you already understand this, so maybe just read it because it is hilarious.